This portfolio provides a discussion of the benefits of a well-structured peer review session in the classroom. While it uses an assignment in a Social Science Research Methods as the primary example, I believe it can be used for any written assignment in any class in any discipline. It simply requires a preparatory step taken by the teacher to adjust the peer review sheet templates that are provided below. OK, let’s begin. A fundamental concept that is central to the Writing in the Disciplines philosophy is that a lot of revision makes writing better. I don’t know about you, but when I was in school, the first draft of anything I wrote was total crap. The second draft was always a huge improvement, with subsequent revisions adding more, albeit increasingly marginal, quality to the work. This revision process also gave me the opportunity to see the larger picture of whatever I was working on, allowing me the time and space to occasionally restructure the entire work, once I understood what it was that I was actually trying to say. Knowing this, I think it is a good idea to give students a concrete reason not to submit the first attempt at their assignment – which may well have been quickly hammered out at the keyboard hours before it is put in your hands. A second central concept of WID is that the more a student writes, the more their writing will improve. OK, so this is basically just a restatement of the old axiom: practice makes perfect. As teachers we all know this, yet as teachers we also fear an overwhelming amount of written work to read through, comment on, and evaluate. So, how do we square these needs without giving ourselves more work than we can adequately deal with in a way that actually helps our students? After all, if we have too much work to read through, the quality of our comments and engagement with the material will also be reduced. One way that I have tried to deal with this is through peer review. Now, I know that many of you have surely tried peer review in some shape or form in your classes, and you may have been successful with it. For my part, I had had mostly bad experiences: I’ve found that students give overly positive comments, very superficial ones, or act as grammar fascists (sometimes mistakenly so). It makes sense that students may find it hard to navigate the social dynamics of having to render judgment on their peers. To overcome this, I have attempted to overhaul the peer review process this term by developing a very detailed list of instructions for reviewers to follow as they read their classmates’ work. Before I give some specific examples of what I tried this term, and what I hope to try in future classes, I’d like to first write a little bit about some of the advantages I see in peer review. The obvious first advantage is that our student-writers get opinions and suggestions from multiple classmates who are also, in theory, thinking deeply about the assignment. These comments offer opportunities for the writer to revise their essay/assignment on the basis of how a number of brains have received their written work. 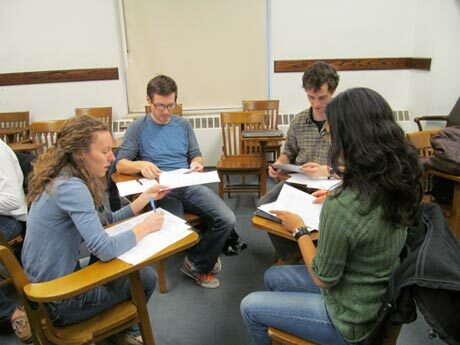 In a single session, writers might get four or five reviews of their work, which they can take home, reflect upon, and make reasoned changes to. This is based on my twin beliefs that the more brains there are on a problem, the better the final product will be, and that students write better when they know that their work will be read by people other than their teacher – (especially when it is their peers, whose respect they are, for the most part, hoping to gain or maintain). Another thing I love about peer review is that it lets students see what kinds of work their classmates are producing. Modeling is another WID concept that I think deserves an entire portfolio on its own, and is definitely worth considering for all of our assignments (especially major ones) – we should always provide our students with examples of what a good response or a well-written essay looks like so that they can understand what it is we’re looking for. By providing models to our students, we give them an idea of how to proceed with their own work. Peer review can, to some degree, serve this function by showing students how well (or how poorly) an assignment has been done by one of their classmates! How about the aforementioned possibilities of an overburdening paper load? If the students are doing the bulk of the reading, reviewing, commenting, and evaluating of the first drafts, there won’t be so much for the teacher to grade. Meanwhile, the students will be writing a huge amount of text – both for the assignment itself (and its revisions) and for the peer review process! The peer reviews that I designed this term demanded quite a bit of written commentary to justify their evaluation choices – each written review probably consisted of about 200 to 400 words. These words are not for the teacher, but for the student-writers – so, again, the teacher can step back as he or she creates a space for the students to write a great deal of text for one another. My favorite advantage of having students do peer review is that it creates a situation in which students act as readers. Aside from the obvious relationship between reading skills and writing skills, the peer review process forces student reviewers into my position as reader and evaluator. By being able to empathize with me, I am convinced that the students would then go back home with their first drafts and think about how these drafts would be received by others in new ways. I think that a major component of good writing involves a clear idea of audience and the commitment to making our writing consumable and engaging for others – why not have students think more about that as they work on their written class assignments? Near the end of term (in week 13), I had each student bring to class two hard copies of the first draft of their research report. I collected them all and distributed half of them randomly with this peer review instruction sheet. The rest of the essays were left in a pile at the front of the class. On the peer review sheet, each student was asked to give a numerical value to each section of the report and to write some clear comments in the space to justify their grade – they were encouraged to frame their comments as readers of the essay and to provide helpful suggestions, rather than superficial positive comments or overly harsh criticisms. They were also instructed not to correct for grammar, spelling or sentence structure – they could write some general comments about it, but were told to focus on higher order problems with the essay (as the peer review sheet’s focus makes clear). The idea here is that if students are writing multiple drafts, they will surely fix many of the grammar and spelling errors in the process – in fact, whole sections of the assignment might need to be rewritten, making early grammar edits moot. As soon as a reviewer had read and commented on their first peer essay, they would come to the front of the class, staple their review sheet to the essay, put the reviewed essay at the bottom of the pile, and take a new one from the top of the pile to begin the review of their next essay. I found that students evaluated anywhere from two to five essays over a 90-minute peer review session (they were encouraged to take a 5-10 minute break to walk around, get some fresh air and come back to grading – after all, that’s what I like to do every hour or so when I’m grading). I found that the results were generally quite positive – the students’ final reports were much better structured than essays I’ve received in past classes, and in past versions of the RM essay. I think that the majority of weaknesses in the final report can be tied mostly to the way that the essay instructions were designed (i.e. it’s mostly my fault – and I’ve thought of new ways to structure this report for future classes). I graded all of the essays using this rubric, and it made my job much easier. So, in future classes, I intend to use this activity for all of my major written assignments. Using the template for the peer review sheet, it is simply a matter of changing the statements of what the student reviewers should be looking for in their peers’ essays. I’m planning to use it next year for my Quantitative Methods final report (it might look like this) and for my Integrative Seminar essay (might look like this). It would make me very happy if this peer review exercise were useful to you in helping to manage the paper load in your classrooms, but mostly I hope that this exercise helps your students to write better papers, as they keep their readers in mind.